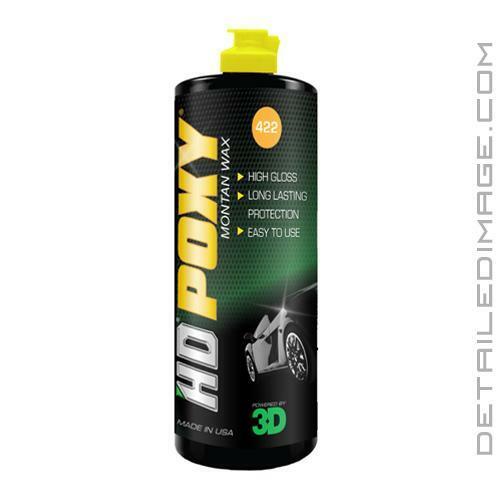 3D Poxy is a hybrid wax and sealant combo, designed to add gloss, depth and protection to your paintwork! Detailers may argue why they like waxes or sealants better because waxes generally add more depth and sealants generally protect longer. With 3D Poxy you do not have to choose one anymore! Poxy is a thick cream that spreads nice and thin with little effort, removal is very easy too. The formula features montan wax, that will produce the ultimate deep, wet look we all love. The polymers in the sealant part of this product will help protect your paint for at least a month. This means you get the best of both of both worlds with your favorite wax and sealant all in one awesome formula! Feel free to apply by hand or with a soft pad and your favorite buffer. 3D Poxy has literally everything you could ask for so grab a bottle today and make your paint pop! HD Poxy is a hybrid Montan fossilized wax crafted to bond to the painted surface for protection and a long lasting durable shine is the highest heat resistant wax on the market. Its properties will darken the appearance and create depth for the ultimate wet-look shine. Works exceptionally well on all colors including dark paints. HD Poxy will give a deep, glossy finish while protecting against the natural effects like bird droppings, acid rain, and hard water deposits. Shake well before use. With a finishing pad, apply in a cool place; 6-8 pea sized drops and work on a 2' by 2' area. Apply a thin layer of product over the entire painted surface using a DA Random Orbital Polisher (slow speed). To achieve the highest protection and bonding, allow the product to cure for 30 to 45 min. before buffing off. Wipe using a clean dry microfiber towel and buff to an extremely high gloss finish. You may reapply every 3-4 months depending on the usage and maintenance of the car.